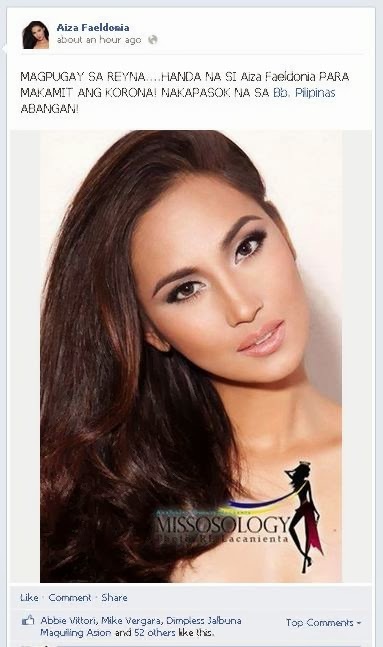 Our very own Aiza Faeldonia is now among the official candidates for Binibining Pilipinas 2014. Aiza Faeldonia was born in Surallah, South Cotabato, she stands 5'10". This was confirmed to us by a reliable source who is also a close friend of Aiza. Our source said that Aiza received a call from BPCI just this evening and is called back to become one of official candidates for the 50th edition of Binibining Pilipinas, the country's most prestigious beauty pageant. Her fan page on Facebook also posted about this good news. Let's wait for the official announcement from Binibining Pilipinas Charities Incorporated (BPCI).